The trip was spurred by an exhibit of Disney art at the Philadelphia Art Alliance, and it turned out to be pretty good. 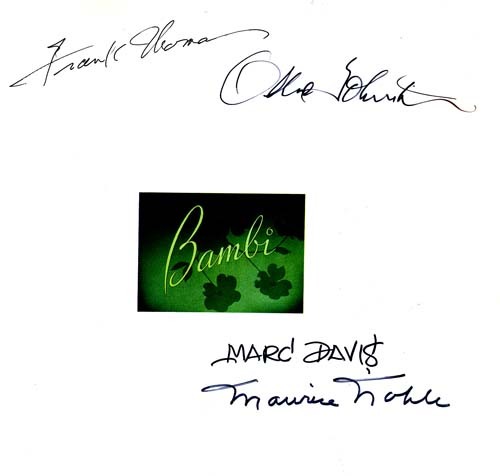 But what was really exciting was the book signing that was held at the show: It was for Frank Thomas and Ollie Johnston’s Walt Disney’s Bambi, and we’d been told that Thomas, Johnston, Marc Davis, and Ward Kimball would all be there. Kimball didn’t show, and I remember being disappointed. But Thomas, Johnston, and Davis were all present, giving Dave and me the chance to meet one-third of the Nine Old Men. True, our encounter was brief–eighteen years later, in fact, I can’t remember any words that we exchanged. Maurice Noble, who dismissed the two years he spent working on Bambi (“my contributions were probably more indirect”) was also present. He had the misfortune to not have been one of the Nine Old Men, and while anyone who loved Chuck Jones cartoons knew who he was, he hadn’t yet entered the renaissance he’d eventually enjoy. So while Frank, Ollie, and Marc were mobbed with fans, Maurice was sitting off by himself. Dave and I hung out with him and thoroughly enjoyed the experience; it led to me interviewing Maurice for Animato . We became good friends.